Solutions to the third exam are now posted on the exams webpage. I wrote up some notes for the proof given in lecture of the Fundamental Theorem of Galois Theory (pdf, ps, dvi). Solutions to the second exam are now posted on the exams webpage. Solutions to the first exam are now posted on the exams webpage. University classes are cancelled on the morning of Thursday, February 11th. So the first exam is rescheduled for Tuesday, February 16th. Also office hours on the morning of Thursday, February 11th will be held in Math Tower 4108 since P143 is closed. The due date for Problem Set 1 has been postponed until Thursday, February 4th (although of course you are welcome to turn in the problem set early). Course Description The description in the graduate bulletin: Vector spaces: Cayley-Hamilton Theorem, Jordan normal form, bilinear forms, signature, tensor products, symmetric and exterior algebras. 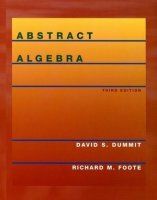 Homological algebra: categories and functors, universal and free objects, exact sequences, extensions. Representation theory for finite groups: irreducible representations and Schur's Lemma, characters, orthogonality. Galois theory: splitting fields, finite fields, extension fields of various types, Galois polynomial and group, fundamental theorem of Galois theory, symmetric functions. Lecture is held Tuesdays and Thursdays, 11:20  12:40AM in Melville Library N3085. Melville Library is in the bottom left corner of D4 in the online campus map. Office hours are Tuesday 9  10am and Thursday 9  10am, 1  2pm in the advising office in Math Tower P-143. Every student will give an oral presentation of approximately 20 minutes during office hours in the last few weeks of the semester. The topic of the presentation is to be determined by the student and instructor jointly. It may be on anything related to the course but not directly covered during lecture or on problem sets, e.g., a skipped section of the textbook, an interesting sequence of (unassigned) textbook problems, related material from another algebra textbook, etc. The topic should be discussed with the instructor and approved no later than April 15th.